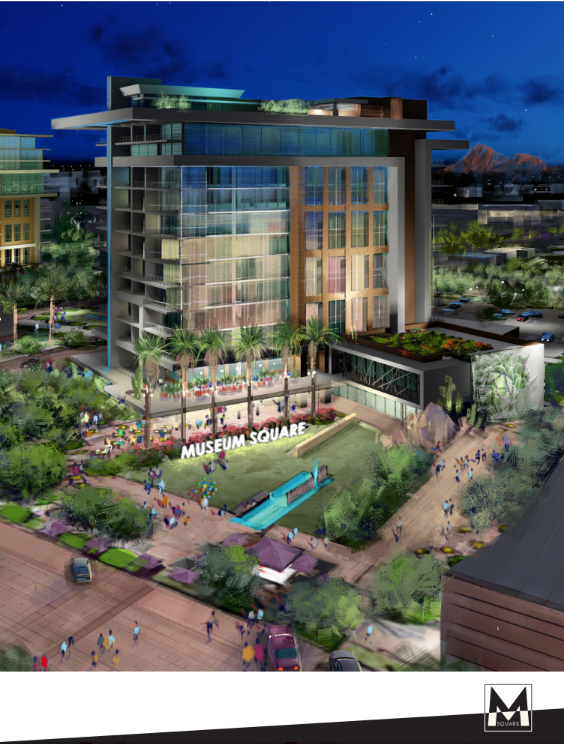 This rendering shows the hotel and open space at the proposed Museum Square development that would sit just south of Scottsdale’s Museum of the West. The hotel and open space cane be seen in this drawing of the proposed Museum Square development looking north towards the Museum of the West. 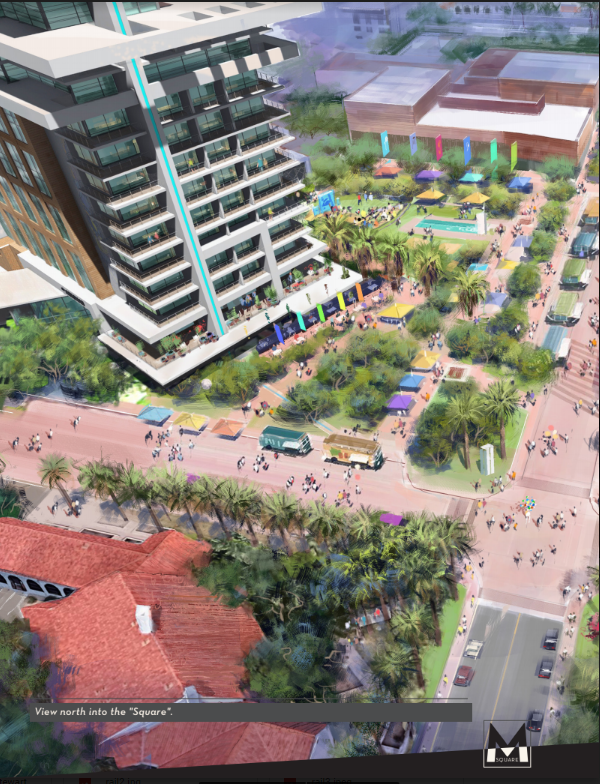 A birds-eye drawing of the proposed Museum Square project depicting three condominium buildings to the south along Goldwater Boulevard and a hotel, open space and apartment building flanking Marshall Way just north of 2nd Street. Though heralded by many as a needed shot of vitality to downtown Scottsdale, Museum Square still has detractors with serious concerns about the development’s potential impact on the surrounding community. At a meeting hosted by Scottsdale Councilwoman Solange Whitehead and former Mayor Mary Manross, dozens of community members filled the former Loloma Transit Station to learn more about the development and share their thoughts. Councilwomen Kathy Littlefield and Suzanne Klapp also attended the meeting. According to plans submitted to the city, the development will feature a 149-foot-high hotel south of Museum of the West where the transit station sits and a 60-foot-high apartment building across the street on Marshall Way. Museum Square would also include three condominium buildings south of 2nd Street, ranging in height from 139 feet to 149 feet. The development would replace the Loloma station but nearby Stagebrush Theater or the Scottsdale Artists’ School wouldn’t close. The development also includes a public park-style plaza surrounding the hotel just to the south of the museum that could be used for events, said Jeff Denzak, a partner with architecture firm Swaback who is working on the project. Museum Square has the support of Museum of the West and the nearby Stagebrush Theater. Developer MacDonald Development Corp. already owns some of the land needed for the development and agreed to pay the city $27.75 million for 180,000 square feet of land adjacent to the museum, including the Loloma site. That land sale is contingent upon the city’s approval of a rezoning request and approval of a development agreement between the city and the purchaser. That rezoning request had been scheduled to come before the Planning Commission in March, though currently no date is listed for the project on the city’s website. The sometimes-heated community meeting last month did not feature many residents or business owners totally against the project. But a significant number had concerns, with many residents upset about the height of some buildings. Business owners worried about how it will affect parking in the Arts District and surrounding areas. Yet, even some of the skeptical attendees said they would like to see the project completed if some of their concerns are addressed. Manross, who was critical of its height, said she appreciated other aspects. She said “the design is beautiful in many respects” and that she liked the open space throughout the project. Many gallery owners said the project would bring in a welcome influx of new customers and they were supportive as long as parking issues were addressed. The biggest issues for residents had to do with the buildings’ height. Manross was concerned about heights exceeding 130 feet and that it will bring more development that high. “There's no way in the world that won't continue to spread throughout the type three areas in our downtown,” she said. Local real estate agent Scott Jarson, who owns a firm downtown, also had issues with the height. Manross said she worries Scottsdale will lose its “sense of place” that attracted many residents to the city if too many high-rises start blocking “view corridors” that enable residents to see the sky and nearby mountains. She acknowledged that some people welcome the additional height and density that she compared to cities like Phoenix, Tempe and Los Angeles. Susan Bitter Smith, who represents the developer, noted that the areas where 150-foot buildings can go is limited to Type 3 development areas. Those areas, approved by the City Council in 2018, include the project site and other parcels as far south as Drinkwater Boulevard along with some land roughly between Chaparral Road and Stetson Drive surrounding Scottsdale Fashion Square and the Waterfront. He said the architects got away from typical styles and worked to develop something truly Scottsdale that is influenced by renowned artists and architects like Lloyd Kiva, Charles Loloma and Frank Lloyd Wright. Denzak also said the team has already made design changes after receiving community feedback, including pushing the hotel further back from the street at 2nd Street and Marshall Way. “At the end of the day, we thought that was a better design,” he said. He also said the architects modified the arrangement of the condo buildings along Goldwater Boulevard to create walkable pockets of open space. Height was not a primary concern for most local gallery owners, though. But Richardson and others said the parking question was still a concern. Bob Pejman, owner of Pejman Gallery, said the buildings could be 40 stories tall as long as there was enough parking. Gallery owners in the nearby Arts District have long complained that there is not enough parking to meet demand during peak tourism season and fear the new project will further cannibalize existing spaces. French Thompson, owner of French Designer Jeweler and president of the Scottsdale Gallery Association, said if customers cannot find nearby parking, they will go somewhere else. Bob Pejman, owner of Pejman Gallery, said he supports the project but does not believe current plans include enough parking to meet the demands of the hotel, apartments and condos. Thompson said he is also concerned parking could be eaten up by individuals providing services to Museum Square residents, including food delivery and house cleaners. Both the city and the developer disagree with this analysis. According to a Parking Master Plan commissioned by the developer and required by the city, the 470 parking stalls provided for the residential buildings exceed the 469 stalls required under current city zoning regulations. The development provides 168 parking stalls for the 190-room hotel, which would be sufficient if the developer receives approvals “to reduce the Hotel parking requirement to current proven hospitality standards,” according to the developer’s zoning application. “The zoning ordinance requirements for hotel and residential accommodate all aspects of use on the site, so visitors, employees, guests – it’s all inclusive in the requirement,” said Scottsdale City Planner Bryan Cluff, who is staff lead on the project. Those assurances do not comfort gallery owners who see the parking analysis performed by J2 Engineering and Environmental Design on behalf of the developer and other recent parking analysis done by the city as fundamentally flawed. The J2 analysis relied heavily on a 2015 city parking assessment for the downtown area and data collected in 2018. It found that the area around Museum Square would have adequate parking to support the project even though the project would result in a 40 percent decrease in public off-street parking (from 352 stalls to 211 stalls). The project would increase public on-street parking from 23 stalls to 60 stalls. J2 observed parking conditions during one of the busiest times of the year – Cactus League play – in March 2018 and found that the area has sufficient parking. The company observed parking during four separate occasions, including one in which a Scottsdale Art Walk coincided with a Spring Training game, and found that 66 percent (105 stalls) of private parking and 36 percent (127 stalls) of public off-street parking in the area remained available. None of the 23 on-street spots were available during the analysis. The J2 analysis also relied on the assertion that people will use fewer cars in the future, citing multiple publications attributing the decline to increases in rideshares, bikeshares and a more dense, walkable downtown environment. Thompson conceded that those relatively new phenomena may take root to affect parking needs in a decade or so but said owners don’t have time to wait that long. The balance between for-sale condos and apartment product within Museum Square could also affect that parking question. Thompson said that residents of apartments typically have roommates, which could create higher parking needs. Denzak, the architect, said that while a price point had not been solidified for the condo units, they would be targeted towards an affluent buyer. He said those buyers would also likely provide an influx of customers for the local gallery owners. Those two factors, parking and an increase in clientele pushed some gallery owners to ask whether the balance between condos and apartments presented by the development team was guaranteed. Bitter Smith, who represents the developer, said the developer is committed to the plans laid out in its zoning application, which indicate there will be one apartment building with under 100 units and three for-sale condominium buildings with over 200 units. She went so far as to say there are requirements within agreements with the city that stipulate the required balance between apartments and condominiums. After being questioned by the Progress, Bitter Smith stated the requirement was included in the development application. While the application does include a proposed number of condominium units and apartment units, the developer is not beholden to those numbers. Brent Stockwell, Scottsdale assistant city manager, speculated the development team could be referring to potential requirements in a future development agreement that would go before the City Council when it reviews the zoning application. Bitter Smith said that ultimately the height and cost to build the three structures south of 2nd Street – designated as condos in the application – more or less guarantee they will be for-sale residences.